(Photo: . 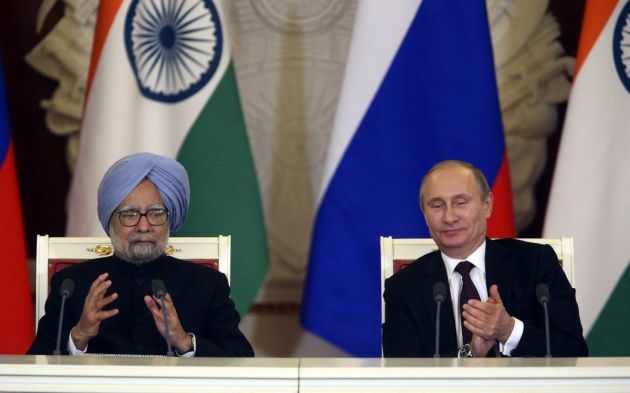 REUTERS /Sergei Karpukhin)Russian President Vladimir Putin (R) and India's Prime Minister Manmohan Singh take part in a joint news conference after their meeting in Moscow October 21, 2013. The Indian capital New Delhi is to get its first Russian Orthodox Church soon. The construction of India's first Russian Orthodox Church will begin as soon as planning approval and financing is settled, the country's IANS news service quoted a senior Russian diplomat as saying. "A decision will be taken soon to begin construction of the Russian Orthodox Church within our cultural centre. "This was the most convenient way of reaching an understanding with the [local] authorities, because no major decision, apart from architectural, will be required," Sergey Karmalito, senior counsellor at the Russian embassy, told IANS. It said as one of the largest of the Eastern Orthodox congregations, the Russian Orthodox Church launched a parish in Delhi in 2011, but held its services and activities in Russian embassy premises. The need for a church building was necessitated by the increasing number of Russians living in India and the need to provide religious services in the country. "The Russian community in Delhi, comprising many women who have married Indians, families of diplomats and other families that stay here for part of the year are the inspiration for this church," said Karmalito. The first Russian Orthodox parish in Delhi, named after the apostle Thomas, was registered in 2006 during the visit to India of the man who is now Moscow Patriarch Kirill, the head of the Russian Orthodox Church. He was at the time serving as head of external relations for the church. The embassy had earlier also considered a proposal for establishing a permanent parish in Goa, where almost 10,000 Russians live for at least six months in a year. IANS reported that the agenda of last year's Moscow talks between President Vladimir Putin and Prime Minister Manmohan Singh reportedly involved discussions on permission to build a Russian Orthodox Church in Delhi. They also touched upon saving Russia's only Hindu temple from demolition threatened by local Moscow authorities.